Terrified of spiders? You'll love the Arachno Car. Here's some good news about Ubisoft and Redlynx's MotoHeroz. 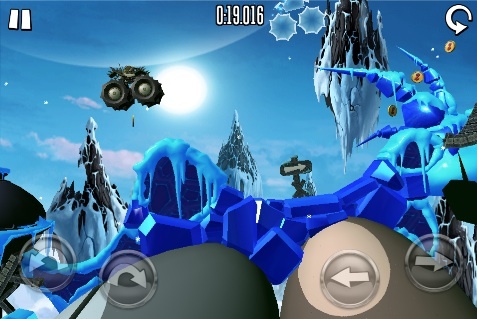 The iPhone and iPad title just received an update that comes with five new tracks set within Ice World, a new vehicle called the Arachno Car and iPhone 5/new iPod Touch optimization. A slimmed down port of the Wii version, MotoHeroz lets players beat the clock as they frantically race vehicles through different tracks filled with loops, ramps and plenty of hazards. The physics are spot on, and the option to compete against other players' ghost times is a key selling point, as you'll read in our MotoHeroz review.